Training — What's Up Dog? Our training methods are second to none. Rather than become hung up on what the latest fad in training is, we professionally assess your dog, then we put our experience to work for you. We use lots of positive reinforcement with fair corrections, and the dog learns right from wrong behavior, as well as respect for you - creating a balanced dog. We like to follow a simple philosophy of Condition, Train, Correct - then we walk it backwards - do not correct a dog that has not been trained to do something, and always condition the behavior through shaping before training. This gives the dog confidence to actually meet your expectations, time and time again. Unlike any other trainer within 100 miles, we have a 6300 Square Foot facility that enables us to use some unique equipment that only professional trainers with the experience we have can offer. This allows us to train the total dog, not just dazzle you with some obedience only to leave you with the same dog on the inside that you came in with. Our total dog training system builds confidence to set your dog free from anxiety and fear which are the key issues that makes dogs misbehave. We also teach you to be confident in handling your dog. The bottom line: we provide results. Thank you! One of our staff members will be in touch with your shortly. Does your dog do one or all of these - or worse? IF SO, YOU ARE IN THE RIGHT PLACE. Scroll down and review our TRAINING OPTIONS and PROGRAMS, then click the MORE INFO BUTTON and one of our trained staff will be in touch with you to schedule your EVALUATION and start getting things fixed. One of the biggest questions most clients have is, "CAN YOU REALLY FIX MY DOG?" The answer is usually - YES! Our method is proven to activate your dog's brain, and to engage your dog to think. Tricks like sit - down for a treat are fantastic, but we can teach your dog to think beyond getting a treat and do as you ask, when you ask, for as long as you ask. In short, we can help you build the relationship you have always wanted with your dog. Training starts with a 2-hour EVALUATION with a trainer. In this session you'll get to know each other, your dog, and the issues you are having. We will show you some basics to start developing the leadership skills you need to have with your dog. This is a fun and informative first session - bring pen and paper, you may wish to take notes. The trainer can help you decide how to move forward in training based on this session. A two-hour session with a trainer in order to assess what problems you are experiencing. We will actually teach you how to communicate with your dog more effectively in this session. We will also evaluate what your dog understands and how quickly it learns. One on one with you and your dog. A full hour of instruction geared toward your dog's specific issues like jumping up or pulling on a leash. Your dog must complete the Evaluation before attending private sessions. 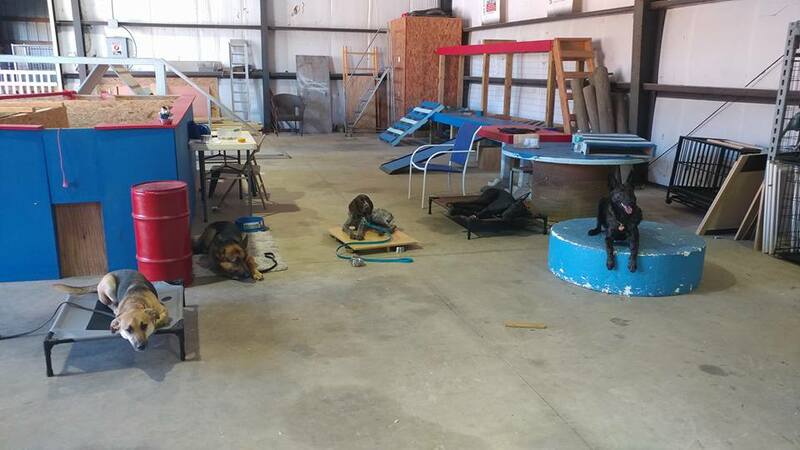 We require that you come to our 6300-square foot training facility to start your training, but we are happy to visit your home to assist with issues in the dog's environment. We are qualified to handle your aggressive dog(s). We do charge more for aggression issues because it requires an additional handler/helper to work with the dog - whether in private sessions or other programs. Rate is per hour at our facility. 4-week imprinting course for your and your puppy to work with a trainer once each week learning to imprint specific tasks. Proper imprinting helps you have a more reliable, confident dog that is easier to train when it gets older. 10-weeks old with current shots required. Package must be completed within 45 days of beginning with a puppy. Full Evaluation Session plus 3 follow up private sessions. Designed to imprint Basic Obedience and teach you how to train your dog properly. When purchased together, you will save 25-dollars. Package must be completed within 90 days of starting. 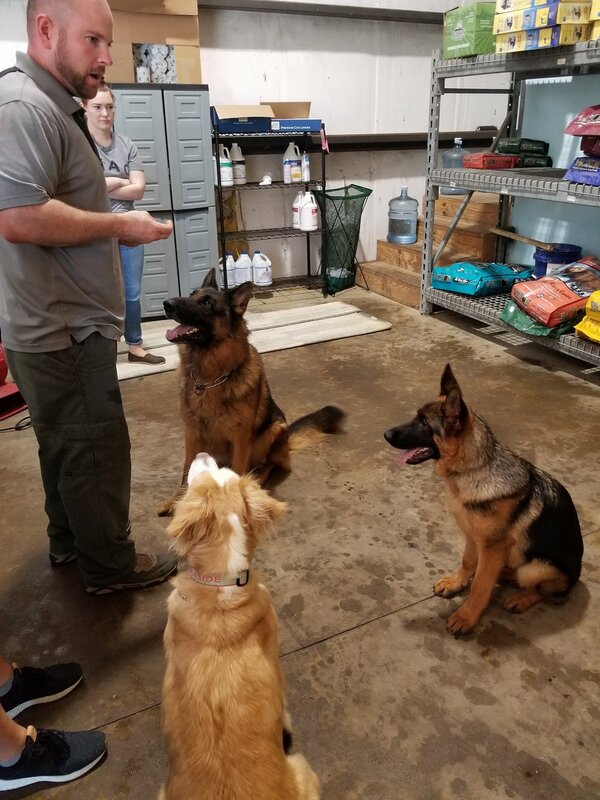 We offer 1/2 hour sessions of private instruction over a 6-week period, along with homework to prepare you and your dog for the AKC Canine Good Citizen test. The test is conducted at the conclusion of the course work when you and your dog are ready. This is a pass/fail test and requires your commitment to homework. 6-week class to introduce you and your dog to the fun of nose-work. We use techniques learned in professional K-9 training to teach the practice of odor detection with Birch, Anise and Clove oils. Class size is limited. Classes are 2-hours for the first class and 1-hour for the next 3 weeks. You will be tested in the last class and you/your dog have the opportunity to earn Certificate of Odor Recognition Excellence (CORE) which signifies that your dog understands the object odors. Same as the CLASS, but private instruction is held for 1-hour on the first session and 40-minutes for the next 3 weeks. 7-day immersive training. Your dog will stay with us for 7 full days of training working on specific issues - not for complete obedience. Each day consists of multiple training sessions and leash walks. This program requires an EVALUATION. Combined programs that will give your dog lots of exposure training, plus an immersive experience with the basics. This program allows you to jump start your dog's training, while keeping you involved. Your puppy will stay at our facility and be imprinted with basic obedience, age appropriate physical and mental challenges. It will have noise and surface acclimation, socialization, and with proper follow up, become a solid dog without common fears or social issues. This is a very comprehensive program that is critical for development for 'working' dogs and pet dogs alike. We will do (2) follow up appointments with you, at our facility, to make sure you are continuing the training properly. This must be started before pup is 14-weeks old, preferably as early as possible provided your pup has its first 2 rounds of shots. Rabies not necessary for this program. 30-day in facility training program. Basic and advanced obedience. On leash and Off leash - Sit/Stay, Down/Stay, Loose Leash Walking, Heel, Stop, Leave It, Recall, Kennel (if desired), Place - are all learned through multiple sessions daily. This is our most popular training plan. You are reunited with your dog and participate in sessions to learn what the dog has learned, before going home. You get lifetime support for training issues, just schedule an appointment to come by the training center and we will refresh both you and the dog!